Do You Need a great bath and body scrub? 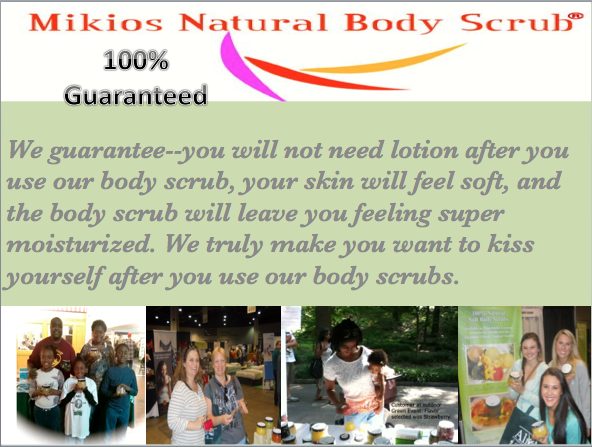 Check out Mikios Natural Body Scrubs, where you can get a true SPA Experience in a Jar of their skin delicious Body Scrubs. These body scrubs not only remove dead skin but they soften & moisturize skin like no other body scrub. If you like the bath or shower experience but want to avoid putting on lotion after jumping out of the shower or bath, this is the body scrub for you. You truly do not need lotion after using the body scrub. These body scrubs smell so good that you almost want to eat them. No, you can’t eat them but you sure can put them on your skin and immediately feel the difference in the texture and softness of your skin. Do you have sensitive skin? Well these body scrubs all contain 100% natural ingredients including olive oil, coconut oil, epsom salt, essential oils, honey, argan oil, and plant extracts. They do not include any perfumes, artificial fragrance, synthetic dyes, parabens, or sugar. To Use them, you simply wet your body during a bath or shower, rub on 2-3 scoops, rinse off, and pat your body dry with a towel. Whalah…you will feel so skin delicious. These body scrubs make you want to kiss yourself. 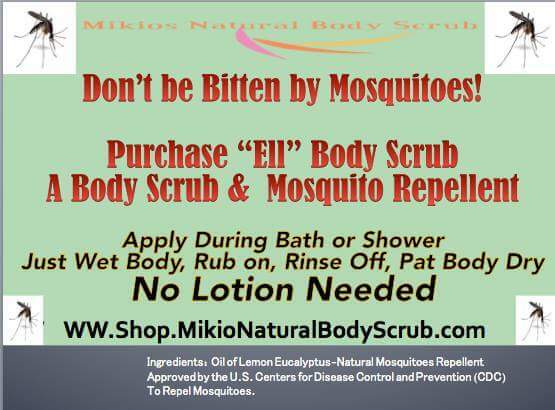 And if you want to know the health benefits of each of the nine body scrubs that they offer, see the website and click on “health benefits.” Lastly, check out the one body scrub that they offer that is also a mosquito repellent called ELL. With the upcoming warm season, you may want to load up on this natural mosquito repellent body scrub that actually works. Want to know more about the company? Go to the website at www.shop.mikionaturalbodyscrub.com or check out their facebook page reviews at www.facebook.com/mikionaturalbodyscrub. This entry was posted in 100 % free shipping, about body scrub, Bath & Body, bath and body scrub, beauty, Body Scrub, chemical free products, cure dry skin, Epsom salt body scrubs, epsom salt vs sugar, Eucalyptus Lemon-Licious (ELL) Body Scrub, health, health and beauty, health benefit of body scrub, healthy skin, Mikios natural body scrub, natural, natural body scrub, natural ingredients, natural product, natural products, organic ingredients, organic skin care and tagged about mikios natural body scrub, all natural, Bath and body scrubs, exfoliate skin, health products, healthy ingredients, nat. This entry was posted in Uncategorized and tagged bath and beauty, Body Scrub, exfoliate skin, Mikios Natural Body Scrub. Have You Kissed Yourself Today? We Make You Want To Kiss Yourself at http://www.shop.mikionaturalbodyscrub. This entry was posted in about body scrub, antioxidants, bargains, bath, beauty, body scrub, chemical free products, coupons for beauty, cure dry skin, epsom salt, Epsom salt body scrubs, exfoliation, gifs for her, gifts for her, gifts for him, health, healthy skin, Mikios natural body scrub, natural, natural ingredients, natural product, organic skin care and tagged antioxidants and skin, Body Scrub Information, exfoliate skin, exfoliation, Mikios Natural Body Scrub. Why we should all Exfoliate Our Skin? Well first, lets understand Exfoliation–Removal of old dead skin cells from the outermost surface of the Skin. So why is it important to exfoliate? Overall dead skin creates a dull and dry look to skin, contributes to wrinkles, and disables products from absorbing into the skin. 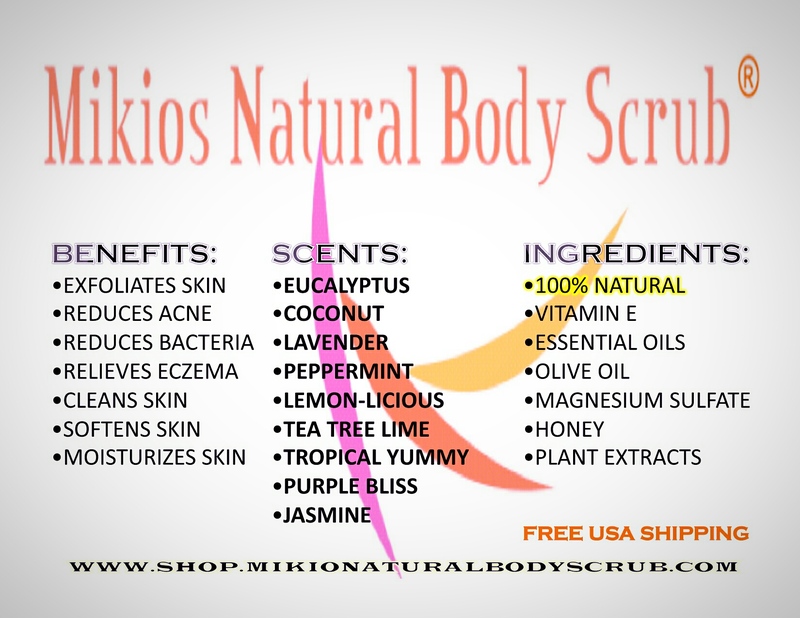 This entry was posted in about body scrub, exfoliation and tagged about body scrub, about mikios natural body scrub, exfoliate skin, exfoliation, What is exfoliation. This entry was posted in beauty, body scrub, bodyscrubs, cure dry skin, exfoliation, health and beauty, skincare and tagged about body scrub, Body Scrub, cure dry skin, customer satisfaction with body scrub, exfoliate skin, guarantee satisfaction, Mikios Natural Body Scrub, What is exfoliation. Natural & chemical free ingredients promote healthy skin, healthy lives, and healthy aging. Check out Mikios Natural Body Scrub for more facts. This entry was posted in beauty, body scrubs, dry skin, health, health and beauty, Mikios natural body scrub and tagged bath, bath and body, Body Scrub, cure dry skin, exfoliate skin, exfoliation, fact about skin, healthy skin, Mikios Natural Body Scrub, skin facts, skin health. What Happens When Facebook Disables Your Account, offers no resolution and fails to respond to the information you send to them to verify your identity. Copper is the New Gold; It is beautiful, durable, medicinal and so very bold. Stop Covering up Your Pretty Face; We Want To See you as Your Are!